Foodie friends, activate! (From left) Kacey Rosauer, Ashley Buckner, Rob Peterson, Erin Peterson and Colby Rosauer. When Erin Peterson realized an important element was missing from the Inland Northwest's culinary scene, she set out to fix it. In the modern age of online restaurant reviews from predominantly amateur critics, and many more likely to rant than rave, Peterson craved a resource for local diners and travelers alike to find authentic, honest recommendations for where to drink and dine in the region's burgeoning industry. "Specifically I noted there was, in our area, a lot of excellence hidden in pockets, and the reviews on different websites didn't always reflect what I was able to find," Peterson says. "We really wanted to honor the restaurants and the chefs and the hospitality professionals who were doing excellent work above and beyond what's expected." 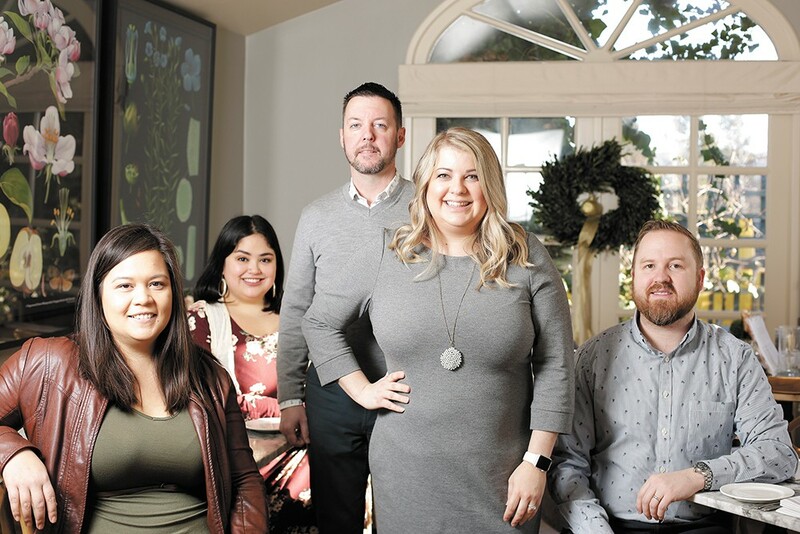 So after plenty of planning and reaching out to friends and fellow foodies, Peterson and her husband Rob founded the Spokane Culinary Arts Guild in mid-2017. In the time since, the organization has amassed hundreds of critiques from its resident "tastemakers," a volunteer group consisting of nearly three dozen local food bloggers (Peterson formerly wrote about food on her blog "Plately Northwest"), food-focused social media influencers and frequent diners chosen by Peterson to provide regular feedback. "I knew there were so many of us out there doing this same thing, and individually our voices were kind of dispersed," Peterson explains. "Collectively we could come together and showcase restaurants around a common goal, and not as paid content, but authentic content that wasn't compromised." Rather than submit open-ended reviews as published by sites like Yelp, Google and Facebook, the Guild's tastemakers are asked to follow a set list of questions and scoring categories that Peterson then compiles into spreadsheets to track details like high and low performance and frequency of reviews per venue. The collective scores are then used to select category winners for the Spokane Culinary Arts Guild Awards; 2018's winners are being recognized at a Jan. 8 gala. On a busy Saturday morning at Madeleine's Cafe in downtown Spokane, Peterson pulls out her phone and scrolls through the standardized form tastemakers fill out within 48 hours of dining somewhere. It covers areas like service, appearance and flavor, with space at the end to leave additional praise or criticism. Peterson asks tastemakers, who dine on their own dime, to visit a minimum of 12 local restaurants each year, though most review many more. While Spokane is in its name, Guild members consider North Idaho and other surrounding areas for coverage. "We all do this as volunteers because we would do it anyway," Peterson says. "It's almost like a really great supper club; we get together and hang out and we love supporting each other and we've become great friends." In keeping with traditional food critic practices, tastemakers are not allowed to alert a restaurant that they're coming in, and restaurants can't pay the Guild to be reviewed. The Guild does, however, offer paid services to local hospitality industry clients, such as event coordination and social media management. "We want to get an authentic experience that a diner would get walking in off the street," Peterson emphasizes. "That particular idea of calling ahead and requesting compensation; none of that will ever happen with us." After a full year collecting tastemakers' feedback on dining establishments of all types across the Inland Northwest, the Spokane Culinary Arts Guild is celebrating with its first awards gala. The industry event includes awards for 2018's top-scoring restaurants in nearly 40 dining categories, along with people's choice awards and accolades for best chef, best bartender, best food event, food writer (disclosure: I am a nominee for the Inlander) and restaurateur. "We are going to try and do this [event] every year," Peterson notes. "This year is kind of a litmus test for how well it will be received. We want people to walk away feeling honored and celebrated." Though it didn't host a reception last year, the SCA Guild presented a smaller batch of 2017 awards to top eateries after the organization's first six months of reviewing. And while its reviews aren't publicly posted, Peterson says the Guild's goal is to present its annual nominee and winners lists to the public as a way of showing which establishments its tastemakers endorse. Guild-recommended restaurants are also regularly showcased on its website (spokaneculinaryartsguild.com) in featured posts, and on its Facebook and Instagram accounts. Considering that the Guild's tastemakers adhere to several ethical practices of restaurant criticism, what happens when a local eatery scores poorly? Nothing, Peterson says. Poorly reviewed restaurants are simply ignored. "We would want our silence to speak as loud as our words. If I am a local chef and I'm not getting any press, what am I doing wrong?" explains Guild co-founder Rob Peterson. "I would love to be a critic, but I can't," adds Erin. "We are food evaluators and we're not going to share our thoughts individually, but off the record and privately. We've had great meals and not-so-great meals in Spokane. We are educated on what to expect and we want to be respectful of the current climate." The couple mainly worry that any negative criticism from the Guild would harm locally owned, family food businesses. If a restaurant is struggling with customer reception and wants to improve based on feedback the Guild may have, however, the couple is willing to help provide that insight. "It's a really fine line of being true to the experience and true to the restaurant, but also saying things that are not detrimental to the business," Rob says. "It's extremely tough." As the Guild continues to grow and establish itself as a trusted resource among diners, the Petersons hope to increase its charity work supporting the region's sizeable hospitality industry. Last year, Second Harvest was a charity partner, and in 2019, the Guild has chosen industry-supporting charity Big Table as a beneficiary. The original print version of this article was headlined "Elevating Excellence"
Fri., April 26, 3-6:30 p.m.